The subject of this portrait was identified by Emily Byrne Curtis (JICSBS, Spring 1989, p. 31) who was not the first to begin the task of identifying the subjects of these portraits, but was certainly the most thorough and the one who will go down in history associated with this effort, among many other pioneering contributions to our understanding of the snuff-bottle arts. Are united in equal measure in his own person. He can ‘be steeped in a dark fluid without being made black’. 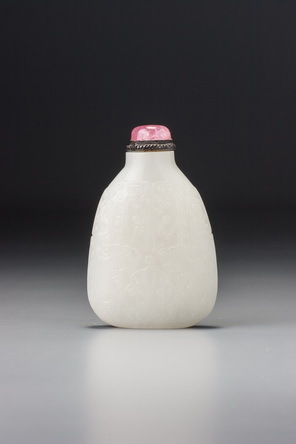 The last line is a quotation from the Confucian Analects, where Confucius justifies his associating with someone who is less than worthy by saying he cannot be corrupted: ‘Is it not said that, if a thing be really white, it may be steeped in a dark fluid without being made black?’ (James Legge tr.) From this, we may gather that the ‘realm of many fragrances’ is not where someone with a pure character would ordinarily be expected to go. The portrait is of Natong (also written Na Tong, 1857 – 1925), a high Manchu official of the same lineage (Yehenala) as the Empress Dowager. 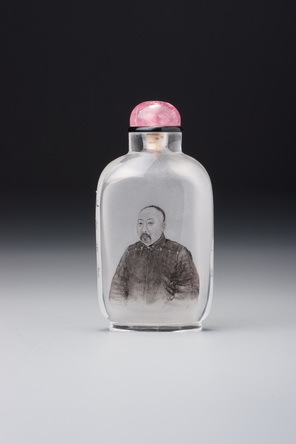 After the fall of Beijing in the Boxer Rebellion, he, Yikuang, and Li Hongzhang were charged with negotiating with the foreign powers; the year before the date on this bottle, Natong had gone to Japan to convey official apologies for the death of a member of the Japanese delegation during the Boxer Rebellion.